Coming up this Saturday is the Fifty West Brewing’s Punch Out: Round 3. The event starts at 4pm and as of this Thursday evening there are tickets still available HERE. Now if you’re not aware of what the Punch Out is then let me try to explain. 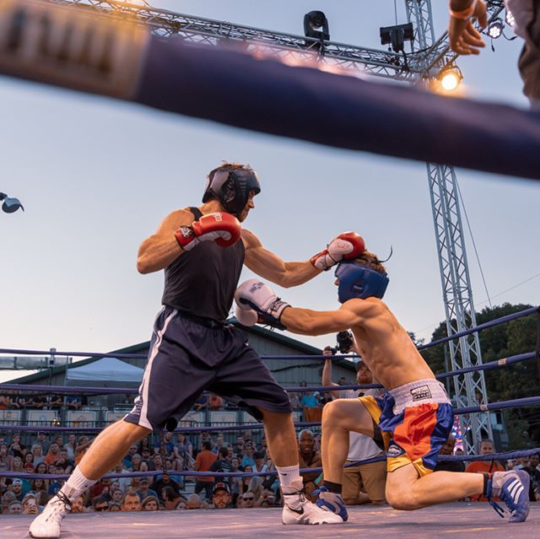 In what I’ll venture to say is the most unique beer event in the country the creative people at Fifty West went out to other breweries around Cincinnati and found people to represent their respective brewery in a boxing match. They paired them up and on Saturday we see 18 match ups between 9 different breweries. If you need a visual let me show you their hype video from last year’s Punch Out. It looks like the coolest thing ever! Or as the kids say, it’s lit! Craft beer and amateur boxing? Sign me up. Needless to say I’m pumped for Saturday. I had one problem though. I’m a fan of all the breweries participating in the event so who am I going to cheer for? I’m a person that draws lines in the sand when it comes to sports and competition and because of that I needed to take sides. I turned to Twitter to help me decide which brewery to cheer on. The #PunchOut match ups are set for 7/7! Who should @GoBeercats be pulling for?! March First is sending out Bryan Fischer to take on Corey Minton of Rhinegeist. I thought it would be cool to hear from the boxer representing the brewery in the ring so I sat down with Bryan (sort of) to ask him a couple of questions about his fight and about March First. Enjoy. Q. What is your roll / job title at March First ? Q. Did you volunteer as tribute or were you picked to participate in the Punch Out ? Why? A. I volunteered because it has always been an interesting event that I have wanted to be a part of. Q. Is this your first time boxing in the Punch Out ? How did you do previously? Will you be trying any signature moves/combos? Q. What’s one thing the good people of Cincinnati have to know about March First? A. We are in the process of an extensive expansion. It will include a bigger, new taproom and patio, more parking, and more production space. Q. What does the brewery have coming up that you’re most excited about? Q. I heard boxers are supposed to trade beers at the end of their matches, which beer will you give to Corey from Rhinegeist? A. We just released a Tropical Blonde that will be at the event. It will be the perfect, refreshing after fight drink. To sum this up Bryan is a Batman-like fighter with secret moves and an expanding brewery supporting him so good luck Corey, you’ll need it. In full disclosure I have not visited the taproom at March First so Saturday before the festivities begin at Fifty West you can catch me there. Feel free to join me! The taproom can be found at 7885 E Kemper Rd, Cincinnati, OH 45249 – look for the red “M” flags out front. You can find them online at www.marchfirstbrewing.com. 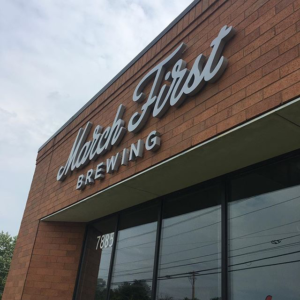 If you’d like to hear a more in depth conversation with the guys at March First and what they have coming up in the near future they recently sat down with the Gnarly Gnome on Cincy Brewcast, listen HERE. Photo credits from the Instagram pages of Fifty West Brewing and March First Brewing, respectively.